It come to our attention all of the sudden a suspected botherder was tweeting some "threatening" tweets.. Strongly showing symptoms of (self and) weak person's abusive behavior.. In a public channel this conversation was recorded. and he confessed a usage of a certain type of malware used for a botnet discussed.. Showing ab extra-hard effort to make impression of lame "educated image" which is obviously taking his energy too much.. The below profile report of his twitter, we logged this just in case he'll delete it (as net crook always does after exposed). This is the PoC of the REAL characteristic of this pshyco-analysed skido botnet herder of GayFgt & Kaiten (as per self-confessed). [justaguy] Do you have any patience? [TheAntichrist] So, Who are you "JustaGuy"? 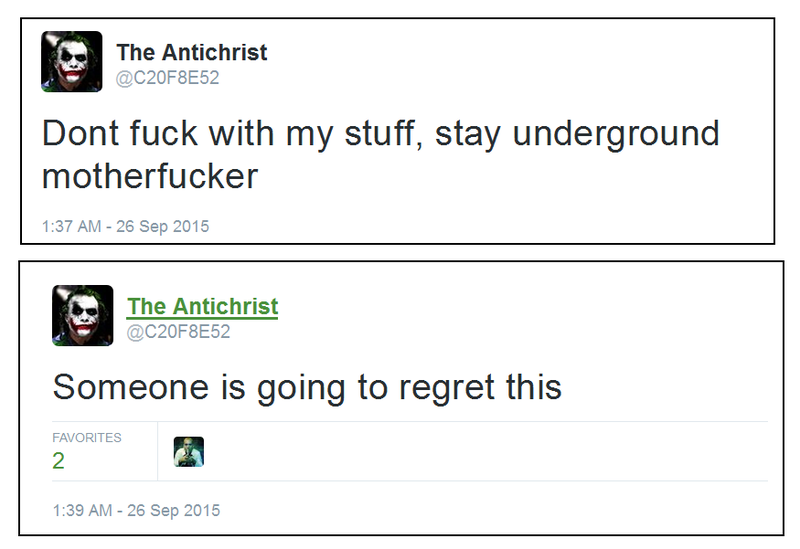 [TheAntichrist] Why did you randomly follow me on twitter and later unfollow me? [TheAntichrist] Why are you guys such a bunch of idiots that you target botnets? [justaguy] I don't even get why you make such a drama. [wirehack7] why is here so much drama? [DarkMatter] no paragraphs for me to read:? What do you think. folks? The crooks was just making Cyber Bully act here :-| And he tried to fake his real personality..